Dear Atame, the problem with you cuff is that either the talon is worn or the tail end of the talon is broken, worn is more likely. The talon (English locksmithing word)is the cut out section of the bolt in which the key passes to move the bolt. 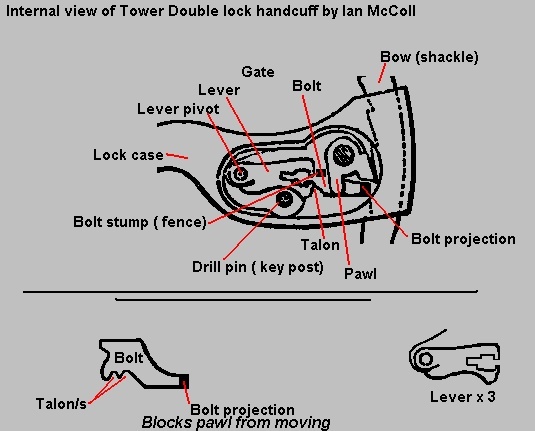 In the Towers there is one talon to move the bolt from double lock to single lock, and another half talon for the key to pull back the bolt in order to release the pawl. The actual thickness of the bolt is only about 1.2mm ( sorry no conversion for inches) and it is prone to wear depending on how often the cuff has been used. Unfortunatly the cuff is not worth repairing as it couldn't be restores to it's former glory. : I have a pair of Tower's Double Lock Handcuffs (Union model) in really great condition (just look at the picture), except one thing: the double lock on one side seems not to work. On the other cuff I could turn the key (which is not an original key) 360 degrees clockwise to activate the double lock and 360 degrees counter-clockwise to inactivate it. Another turn of approximately 200 degrees counter-clockwise (until the key stops) unlocks the cuff. But on the other cuff I could turn the key counter-clockwise as often as I like without stop - I must explicitly hold it at 200 degrees if I want to open the cuff. And when I turn the key clockwise there seems to be a kind of barrier at 45 degrees - no double lock could be activated. Does anybody have a idea what could be wrong and how I could repair it?